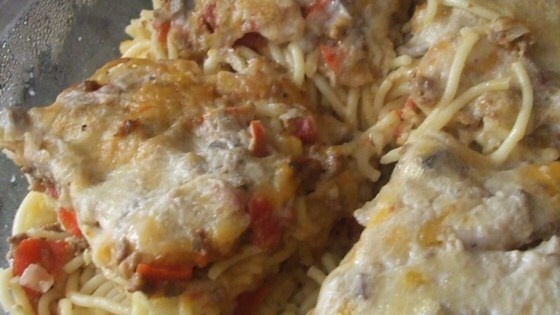 "Make this tasty dish ahead of time, and cook it when needed. Allow a little extra cooking time if you make this ahead and refrigerate." Bring a large pot of lightly salted water to a boil. Add spaghetti, and cook for 8 to 10 minutes, or until al dente. Drain, and set aside. In a large skillet over medium-high heat, saute the onions, green peppers and ground beef. Once beef is brown and onions and peppers softened, add the tomatoes, mushrooms and oregano. Simmer uncovered for 10 minutes. Preheat oven to 350 degrees F (175 degrees C). Grease a 9x13 inch baking dish. Place half of the cooked spaghetti into the prepared dish. Top with half of the meat mixture. Sprinkle with 1 cup of the mild Cheddar cheese. Repeat. In a medium bowl, mix together cream of mushroom soup and water until smooth; pour over casserole. Sprinkle with Parmesan cheese. Bake in preheated oven for 30 to 35 minutes. Let stand 10 minutes before serving. See how to make a simple weeknight favorite. Time consuming dish. I added extra mushrooms for more taste - still, not a memorable meal. A weekday family meal, but definitely not company fare.